I wrote extensively about this innovative winery after my previous visit earlier this year (PinotFile, Volume 7, Issue 13). The five Rhys estate Santa Cruz Mountain vineyards are scattered throughout the Skyline subregion within a 25-minute drive of each other. Each vineyard has a distinctly different soil and geology and presents special challenges to successful winegrowing. Proprietor Kevin Harvey is quick to admit that it has taken time to learn the vagaries of each vineyard’s microclimate and topography, and the most appropriate clonal selections for each site. The Alpine Road Vineyard, pictured below, is very steep requiring hand farming and measures to control erosion. Yields have been painfully low, and the cost of developing this vineyard has exceeded all expectations. Harvey is a bright and determined sort and he obviously enjoys the challenges. 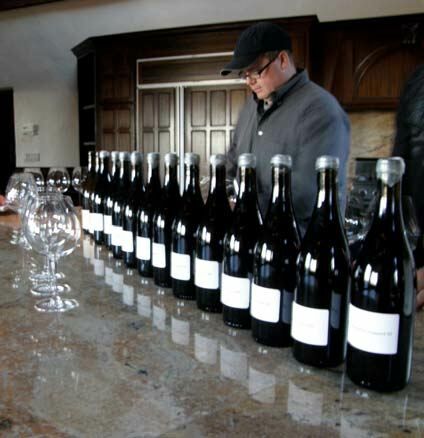 His first wines have made a big impression on the wine community, and this has fueled his determination. The model at Rhys is clearly Burgundy and more specifically domains such as DRC and Dujac. Several of the vineyards are planted to close spacing using a multitude of Dijon and California heritage clones duplicating the clonal diversity or selection massale approach in Burgundy. 100% whole cluster fermentation is the rule, making these wines less appealing upon release than they become upon aging, much like their Burgundy brethren. There is no compromise in vinification that would lead to early and flashy consumer-friendly drinkability. That said, the 2007 vintage Pinot Noirs are extremely appealing now, but will definitely reward more time in the cellar. Winemaker Jeff Brinkman (pictured below) is reserved and unassuming, but when you engage him to talk about his winemaking goals, his insight and talent is evident. 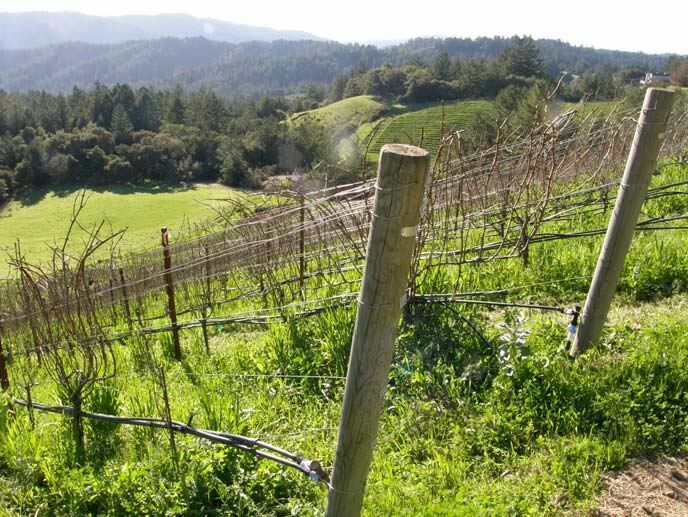 Rhys Vineyards is developing a new vineyard in Anderson Valley named Bearwallow, named after the Bearwallow-Wolfey series of soil that dominates the property. This vineyard has 7 acres of 9-year-old vines that are in production and have been farmed organically. The first vintage from this 20-acre site is 2008 and is vinified using grapes from these existing vines. The vineyard, which is in the far deep end of the Anderson Valley, will need several years of refurbishing and updating to reach its ultimate potential. This vineyard meets all the criteria that Harvey considers critical for producing great Pinot Noir: shallow soils, deeply fractured and rocky subsoil, steep non-forested slopes, iron-rich soils (a key to minerality in Pinot Noir), moderate clay content with limited water holding capacity, and a cool climate. New plantings in this vineyard will be on the steeper slopes that meet all the criteria. Vine densities will be 2300 (tractor farmed) and 7000 (hand farmed) vines per acre. Planting will be with selection massale, a diverse mixture of vines. Most of the vineyard will be devoted to Pinot Noir, but a few blocks will be dedicated to Chardonnay. A new winery on Skyline Drive is nearing completion and will be ready for the 2010 harvest. Built entirely underground, the grapes will enter the cave entrance and the finished wines will exit through another opening in the cave. Expect this to be the showpiece winery in the Santa Cruz Mountains and bring much-needed recognition to this region. A tasting room will be opened in a former home on the property which has magnificent views of the surrounding terrain. We tasted through barrel samples of the 2008 vintage. Typical for Rhys wines, the alcohols are under 14.0%. The Pinot Noirs are showing generous and appealing aromatics and intense mineral-laden fruit, with substantial tannins at this point. 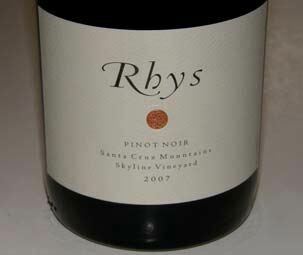 There is a special charisma to the Rhys Pinot Noirs that will appeal to the connoisseur. The Home Vineyard Pinot Noir is a dense wine with deep, dark reddish-purple color, hard tannins, and a lush finish. The Family Farm Vineyard Pinot Noir exhibits the most whole cluster character complementing the earthy dark berry fruit. 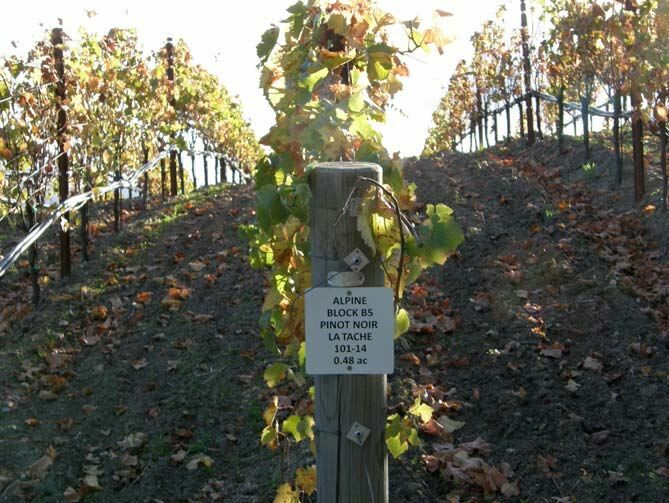 The Alpine Road Vineyard Pinot Noir is a ringer for a Cote de Nuits wine with its rich black raspberry jam flavor and generous tannic backbone. The Swan selection bottling from this vineyard is the star in the lineup with more nuances and savoriness. Horseshoe Ranch Vineyard is more akin to a Beaune wine with a lovely floral scent and noticeable underlying earthiness and minerality. Skyline Vineyard is rather exotic, flush with well-spiced dark cherries and berries, and showing substantial young tannins. Bearwallow Vineyard Pinot Noir has more approachable dark red Pinot fruits and a crispness that reveals its cool climate origins.